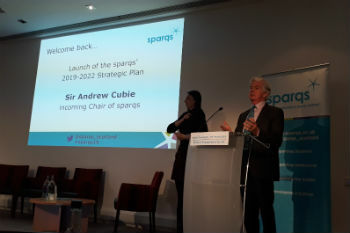 At the sparqs’ conference on 28th March 2019, we were delighted to formally welcome Sir Andrew Cubie into his new role as Chair of the sparqs’ Trustee Board. Sir Andrew succeeds Professor Norman Sharp OBE, to whom we bid a fond farewell. Professor Sharp has been a huge support in his role as Chair and we sincerely thank him for his guidance and much-valued expertise in taking forward the work of sparqs over the last eight years. Sir Andrew noted that he is honoured to follow Norman, who has contributed so effectively to the interests of student learning in Scotland. Sir Andrew brings a wealth of experience to the role, from both within and outwith the higher and further education sectors. Most notably, he acted as Convenor of the Independent Committee of Inquiry into Student Finances in Scotland – known as the ‘Cubie committee’ – which led to the abolition of tuition fees in Scotland in 2000. Sir Andrew has previously held positions as Chairman of the Court of Napier University, Chairman of the Committee of University Chairmen for the UK, and Chairman of the Scottish Credit and Qualifications Framework, as well as acting as a member of the Management Board of Her Majesty’s Inspectorate of Education and Education Scotland. Sir Andrew's first task as our new Chair was to address the conference and launch our new Strategic Plan 2019-22, which sets out our work and direction for the next three years. The vision of our new plan is that students are partners in shaping the quality of learning, making positive change to their own and others’ experience, however and wherever they learn. The plan outlines our key principles and approaches which will underpin our programme of work over the coming years, in order to achieve our new strategic priorities. We look forward to working with Sir Andrew and the rest of our Trustees in taking forward this timely and ambitious new plan. We trust that sector colleagues will join us in welcoming Sir Andrew to the role and we look forward to working with him going forward.